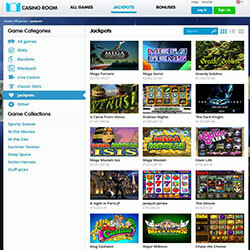 Casino Room brings something new and exciting to the world of real money casinos: social gambling. With a stunning design that’s absolutely up to date, and a host of daily missions to complete, this is a casino with a difference. Of course, it wouldn’t be a modern casino without a complete mobile version, and it is smooth and simple: offering players the best games in a welcoming environment. With a host of banking options, as well as 24/7 support, Casino Room is a great choice wherever and whenever you want to play. Casino Room doesn’t just offer great slots, they offer great slots from 4 different softare developers. Not only are there renowned games from Microgaming and Net Entertainment, but the Betsoft back-end makes it all possible, and the Evolution live dealer table games are a joy to behold. 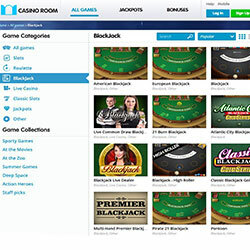 Casino Room has a host of blackjack games available from respected developers Microgaming, Net Entertainment, and Betsoft. There’s something for everyone here, with 21 Burn Blackjack, Single Deck Blackjack, Multi-hand, and much more. It’s the slots where Casino Room really comes alive, though, with a huge variety on offer. 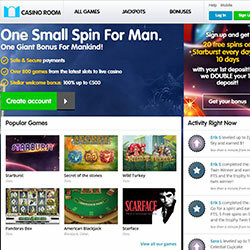 There are modern gems such as Net Entertainment’s new South Park slot, classics such Microgaming’s Tomb Raider series, and Progressives such as Mega Moolah. What’s more, you can enjoy these games on your mobile device too. Casino Room does everything simply and well. The same applies to their bonuses too, as there is a very simple and excellent welcome bonus on offer. What’s more Jackpot Finder players get a little bit extra too. 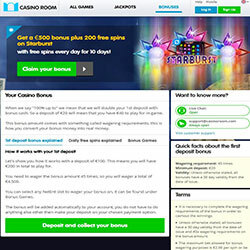 You can collect a cool 100% up to £/€500 (CA$800, AU$900, 5000kr, 70,000 YEN (JPY) + 20 + 60 Free Spins on Starburst** (Code: CRBONUS)), first up, with 60 freespins on Starburst, too. The players who are playing from UK, Ireland, Canada, Australia, New Zealand, Germany, Austria, Switzerland, Sweden, Norway, Finland and Japan get: 20 (on registration) + 60 (after depositing) Free Spins on Starburst + 100% up to €500/£500/CA$800/AU$900/5000kr and 70,000 YEN (JPY).